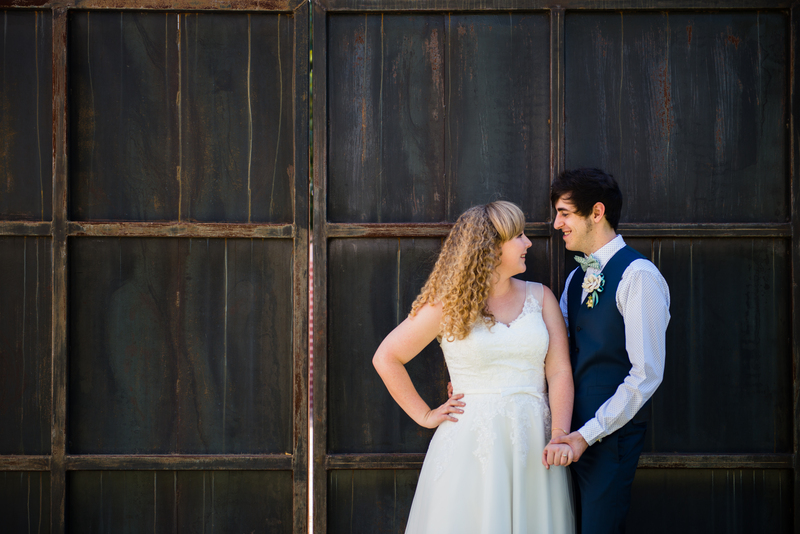 Marie and Cord met in architecture school, bonding over their love of old industrial buildings. While looking for their venue, they wanted a space with a nice design but also lots of character. At Georgetown, a city located in Texas, they found their perfect location in Union on Eighth. Marie and Cord tied the knot on October 2, exactly seven years after they first started dating. Seriously, this wedding is just too cute! All images are courtesy of the wonderful Sarah Whittaker from Photo La Vie. You can find Marie’s dress here. Q: Why did you pick this location? Georgetown has one of the most beautiful historic courthouse squares in the state. A friend who lives there told me about a venue one block off the Square that had recently opened in an old auto repair shop. 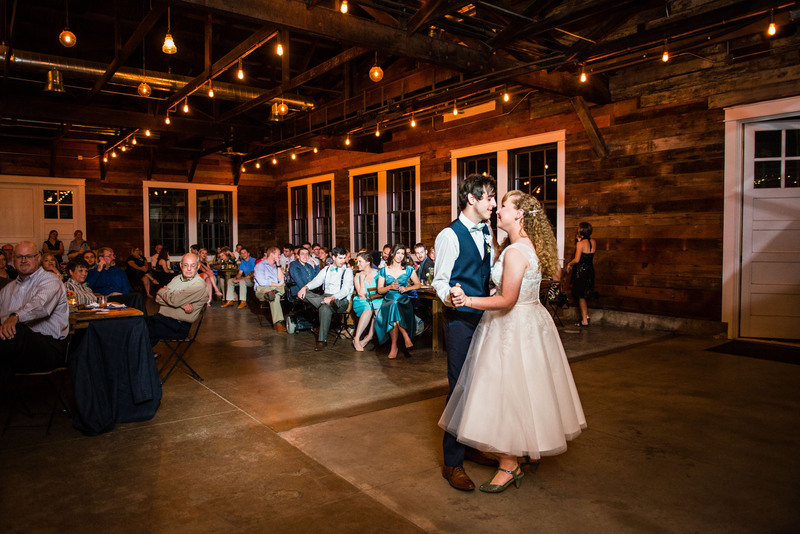 We took one look at the Union and knew we had to have our wedding there. The owners had preserved all the historic features, while adding their own special touch with unique lighting and furniture. 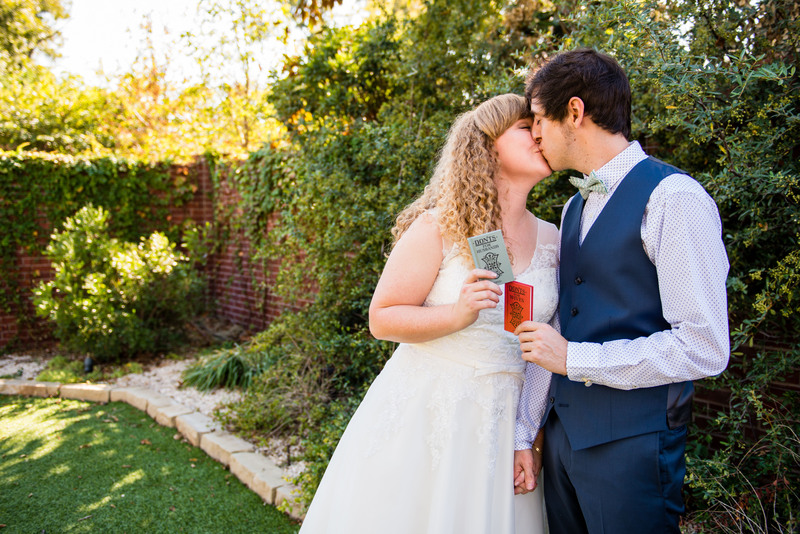 In two words, our wedding was eclectic vintage. The common denominator was vintage books. Cord’s last name is Read, we both love to read, and I am a little obsessed with vintage book covers, so a book theme just made sense. We made some books into planters and used them as centerpieces. We also added vintage jars with candles and flowers to the mix. Each table was unique. The venue was stunning in its own right, so besides the tables, we didn’t have to do much else. There are too many to count, but the best had to be when Cord and I got in the car at the end of the night and finally got to take it all in. Literally every person we love showed up in a place we love to celebrate our love. That realization was so profound, it’s still hard to believe that it wasn’t a dream. Q: Why did you choose Azazie for wedding dress? My Azazie dress was actually the second dress I bought. I’ve always known I wanted a tea length dress, but when I first started looking I got sucked into all the long white cream puffs at the first dress store I went into and placed an order for a strapless, floor length dress, that was beautiful, but now looking back it was just not me. The universe knew it wasn’t the dress for me either, because 5 months later when it came in, it was two sizes too small. The store admitted that they had ordered the wrong size, but could not get the same dress in time for my wedding that was six weeks away. They refunded my money and that night I ordered my Azazie dress. I had seen it online early on in the planning process and kept going back to it in my mind. It came in a few weeks later and with a little bit of tailoring, was PERFECT! It fit like a glove and the craftsmanship of the dress was impeccable. To top it off, it was significantly cheaper than the original dress and 10x prettier. Azazie saved my wedding day. Take your time and enjoy the process. It will go by fast and you’ll never get this chance again. You’ll be frustrated with money and all the people that want to insert their opinion, but your wedding day is for you and your fiance. No one else. Overall, yes I loved wedding planning. It was stressful at times and the cost of things was shocking on more than one occasion. 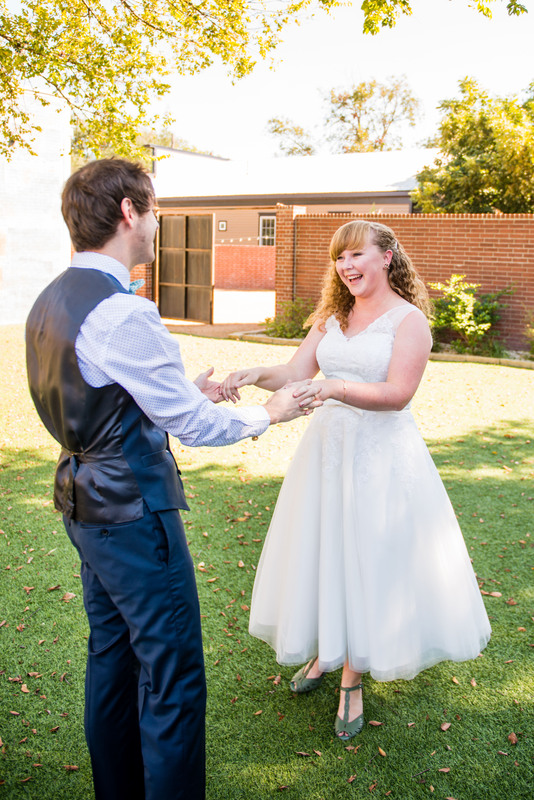 Our wedding was completely DIY, which created all these little moments before the wedding that were equally as special. My parents helped me find our venue, while my fiance was busy with school. Both my mom and my mother-in-law helped me hunt for books and other antiques for the decorations. Cord and his dad made books into planters for the tables. Friends came over and helped me put it altogether. The 8 month process of creating our wedding allowed us to share more memorable moments with all the important people in our lives, instead of just one day. The Paris dress caught my eye first because it was tea length. I love the retro look of the tea-length and logistically it was easier to dance and move around in. Second, I loved the neckline and how the lace was focused on the top of the dress. It had enough detail without being too frilly. The style and fit of the dress was special enough for my wedding day without making me feel like someone else. This dress was a wonderful match for Marie. I’ve known the happy couple for several years, but I met Cord when he was about 6 years old. The entire wedding was just so special. Thank you for this feature story. Of course! We are smitten with their wedding and even more in love with the fact that Marie choose one of our dresses for the special day.